The following essay was submitted by Iota Ultsch. ZOOMING in and out of a SYSTEM facilitates the study of STRUCTURAL and BEHAVIOURAL hierarchies, yielding, in some cases, the key to understanding, otherwise seemingly CHAOTIC organisations at their most fundamental level. All systems, regardless of SCALE or degree of DETAIL apparent, contain values which can assist in their identification, and properties which allow one system to COMMUNICATE with another. An example of these phenomena can be illustrated by the initial and sometimes final division of spatial configurations, within an architectural program for circulation into the binary zones of public and private. Here, the private zone and its associated behaviours can be identified as the primary node of a plan’s system. Conversely, the public zone of a plan, allows REACTION and INTERACTION, between the primary inhabitants and external parties. The public zone can therefore be seen as a FORUM for changeability/mutability, as it allows external stimuli to penetrate its otherwise ordered realm. Second Life presents opportunities to explore and observe the MUTABILITY of such systems with the paradigm of the blurring of the private and public zones becoming more relevant to the metaverse. An indispensable tool for studying human behaviour within various spatial and social contexts. The MIND AVATAR begins its journey by creating an idealised physical representation of the ID within the virtual realm. The representative HOST BODY [BODY AVATAR] soon learns to manipulate cameras and movement in order observe, learn, communicate with other avatars and facilitate interaction with spaces. Traversing the virtual environment via teleporting, flying, point-animating or simply walking, the AVATAR perceives and responds to virtual space as a series of perpetually distorting, texture-mapped surfaces offering everything from infinite vistas to jarring dead-ends, forcing the MIND AVATAR into a CHANGE IMPULSE condition. “Change impulse” is my term to describe both the cognitive and emotive; the involuntary responses to any environment, which occur as a result of the mind-avatar’s degree of compulsion/repulsion to the spatial experience in question. 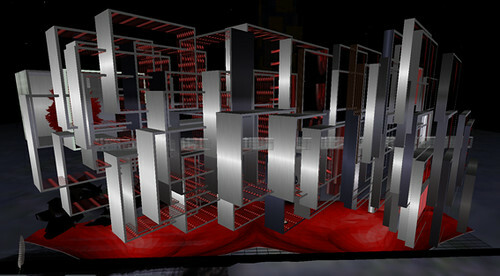 The “Tree of Second Life” build is part of a tripartite proposal. It was designed to interrogate the meaning of architectural practice in virtual space by challenging traditional [Real Life] architectural paradigms and establishing to what extent these paradigms are supported or simply collapse in a metaverse. The build was designed to be visually permeable. An avatar can walk a bridge directly to the Tree of [Second] Life, fly through the mostly phantom space for a dynamic, phenomenological experience of the form, or sit and pose at various points, allowing for a more static special experience. The build is composed of a series of interwoven orthogonal prims floating above the site. Textured with alpha transparency and rendered steel, the build is BODY MAPPED with deconstructed AVATAR body parts created in Poser and sculpted in MAYA, the fundamental 3D software for Second Life’s avatars. A narrow suspended internal bridge leads the avatar through the build and reaches a solitary tree in a concrete box. The displaced and interwoven body parts act as metaphor for the diverse sociocultural demographic of Second Life. These images, relating to the human form have spatial significance due to our subliminal attraction to representations of ourselves. i.e. GESTALT. Form thus, FOLLOWS FORM. Finally, the Tree of [Second] Life; a place where MIND + BODY AVATAR come to rest and reflect…perhaps a harbringer of sustainable solutions to REAL LIFE from the metaverse. Books, Cambridge, Mass. : Distributed by MIT Press, New York, 1997. Kauffman, Stuart A., At Home in the Universe: The Search for the Laws of Self-Organization and Complexity. Oxford University Press, 1995.De Landa, Manuel, Uniformity and Variability: An Essay in the Philosophy of Matter, 1995. Dodds, George and Tavernor, Robert, Body and Building, MIT, 2002.Foreign Office Architects, Phylogenesis, Actar, Spain, 2004. Mackewn, J. Developing Gestalt Counselling, London, UK: Sage Pulications, 1997. Vidler, Anthony, Bodies in Space/Subjects in the City: Psychopathologiesof Modern Urbanism, from Differences 3, 1993. Wolfram, Stephen, Complex Systems Theory, Addison-Wesley, 1988, [pp. 183-189].